Vegetables play a prime role in human nutrition. It can be eaten either by cooking or raw. It contains less fats and carbohydrates, but more minerals and vitamins. Vegetables were available only in some countries during the early days but now it is cultivated all over the world. Eating more vegetables may keep us away from diseases, especially consuming vegetables which contains more fiber may reduce the problem of heart disease, obesity and diabetes. 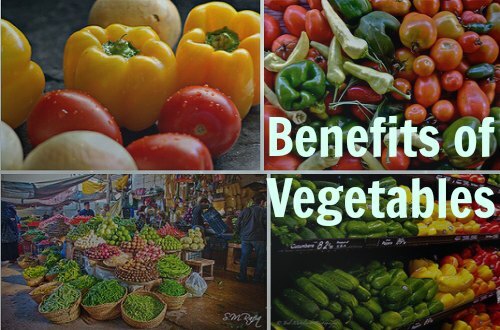 There are some health benefits which we can gain from vegetables which are explained below. Beetroot is simply called as beet and it is also an herbaceous plant. It is mainly used in salads and soups and can also be used as a coloring agent. It also contains high sugar and various health proportionate. Beet helps to decrease the Blood pressure and heart diseases. Increases the blood flow to the brain. It contains high nitrates that are converted to nitrites due to the bacteria in the mouth. The nitrites also help to open the blood vessels and increase the blood flow. Reduce birth problems for pregnant women and prevents them from cancer. Cabbage is regarded as one among the oldest and several layered vegetable. It is leafy in outloook and green or purple in colour. There are many different cabbages available. They are Napa cabbage, Green cabbage and Savoy cabbage. Cabbage walnut salad is a classic salad which is healthy and delicious. More recipes can be done with the help of cabbage. It contains high vitamins, fibre and minerals. Cabbage is helpful for cancers, ulcer, and also heals the process of wounds, damaged skins. It is rich in iodine and vitamin C than orange. Leaves of cabbage helps to get relieved from headaches. It is helpful in weight loss, bone protection, brain health and reduces the blood pressure. Radish is one of the best widely used root crop all over the world. They have various sizes, colours, length and numerous varieties. It is pungent sweet in taste and mainly used for salads. It can be eaten either with or without being cooked. It is a very good source of vitamin C which helps to rebuild the tissues and blood vessels. It regulates the blood pressure and prevents the respiratory system like asthma. It is a natural diuretic, purifying the urinary systems, kidneys and relieves inflammation. It mostly prevents from jaundice, piles, cancer and diabetes. It has very high fiber that prevents from excretory problems and relieve from constipation. Organic snake gourd is long and curved in size when compared to inorganic snake gourd. It is rich in taste and cultivated all over the world. The skin is harder and used for medical purposes. It has high water content. Its taste is bitter but it disappears after cooking. It contains vitamin A, B, C and less in calories but high in protein. It prevents our body from digestive issues because of the high fiber content and eliminates constipation. It protects from hair loss, increases the growth of new hair and reduces dandruff. It prevents us from blood pressure and reduces the stress in the cardiac system. It controls diabetes because of the low calorie and high nutrition. The stage of carotene and vitamin C helps to boost the overall health and reduces respiratory problems. It contains high fiber which helps to reduce the cholesterol level in blood and decreases the risk of heart attack. It is rich in nutrients like vitamin C and reduces cancer causing radicals. It is rich in minerals like iron and rich in vitamin E and prevents the formation of kidney stones. Their iron content increases the blood circulation and boosts the creation of Red blood cells. Helps to improve bone health and reduces problems of developing anemia. Prevents from cancer and weight loss. Turnip is a tuberous vegetable which is stout round in shape. It grows during the cold season and seen in two different colors green and pink. It is cultivated all over the world. It can be eaten either raw or cooked and its stems are mainly used in salads. It is rich in taste and healthy. It contains good amount of B-complex vitamins such as niacin, B-6 vitamin, etc. Turnip leaves are very nutritious and contains vitamin K and carotenes. It is good for the circulatory system and reduces the chances of digestive problems. Maintains the immune system and prevents from cancer. Normalizes the sugar for diabetes patients and stabilize blood pressure level. Take one glass of turnip juice along with the carrot juice each morning increases the health. It helps to reduce the skin diseases and helps to improve nerve and muscle function.